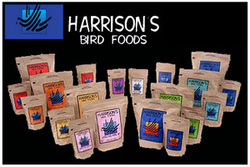 Harrison's Bird Foods� are the formulas that provide proper nutrition for your bird's lifetime care. Because the single most important thing you can do for your bird is to feed it right. Harrison's Bird Foods is a family of certified organic, formulated diets that were created by avian veterinarians and nutritionists with the health of your bird in mind. Our formulas require little or no supplementation. Dr. Greg Harrison, the main developer of Harrison's Bird Foods, is a certified avian specialist with 34 years experience in bird care. He has transformed his practice into an avian wellness clinic that incorporates preventive medicine through proper nutrition with Harrison's Bird Foods. As occasional treats. Not to exceed 5% of the total diet. Used with Builder as an organic conversion tool prior to being switched to a formulated diet to improve health previously compromised by preservatives, pesticides and an unbalanced diet. Not licensed for sprouting or human consumption. � For birds needing an easily assimilated source of nutrients..
� For medical and surgical patients that are recovering from pansystemic failure. � For nutritional support of a bird during the transition phase of a diet change. � For birds in which anorexia has slowed gastrointestinal emptying time. � For hand-feeding psittacine chicks from hatching to 1-3 weeks of age..
� For young birds needing an easily assimilated source of nutrients..
� Smooth texture for acceptability by birds until they are eating on their own. � A nutritional handfeeding diet for growth from hatching to fledging of passerines such as swifts, swallows, the large-sized flycatchers and warblers, shrikes, chickadees, titmice, larks, woodpeckers, jays, mockingbirds, robins, grosbeaks, song sparrows, towhees, goldfinches, finches and more. � For hand-feeding psittacine chicks until weaning. � To follow the feeding of Neonate Formula for selected parrots (see below). � For birds recovering from illness or injuries and birds losing weight during a diet conversion. An Adult Lifetime formula may be offered after a bird has completed a dietary program of a High Potency formula for a period of 6 months. For birds with certain dietary sensitivities. This year-round maintenance formula meets the nutritional requirements for healthy, non-breeding, non-molting birds including canaries, budgies (parakeets), cockatiels, doves, lovebirds, conures, parrotlets, pigeons and other small birds. This year-round maintenance formula meets the nutritional requirements for healthy, non-breeding, non-molting birds including lories, cockatiels, lovebirds, quakers, doves, pigeons and other small to medium birds. This year-round maintenance formula meets the nutritional requirements for healthy, non-breeding, non-molting birds including canaries, finches, budgies (parakeets), parrotlets, cockatiels, lovebirds and other small birds. This year-round maintenance formula meets the nutritional requirements for healthy, non-breeding, non-molting birds including pionus, Amazons, cockatoos, macaws and other medium to large parrots. Pepper Lifetime formula may be offered after a bird has completed a dietary program of a High Potency formula for a period of 6 months. A spicy alternative to Adult Lifetime Coarse Formula. May be added to High Potency to assist in diet conversion. May be offered to birds with clinical signs of papillomatosis. May be used as a foraging treat. A year-round formula for canaries, doves, budgies (parakeets), cockatiels, lovebirds, finches, pigeons and other small birds. Conversion:All birds should start out and remain on High Potency Formula for a period of at least 6 months. Special needs:For birds that are molting, overweight, underweight, particularly active, housed in a cold climate, recovering from an illness or affected by liver or kidney disease. Weaning Birds:Feed High Potency Formula for at least 6-9 months. Breeding Birds:Birds should be fed High Potency Formula 1-2 months prior to the breeding period and until chicks are weaned or for at least six months before resuming Adult Lifetime Formula. The amount of supplemental certified organic vegetables and fruits may be increased until the chicks are weaned. For each 2 Tbs (20 g) Formula, add Â½ (5 g) Tbs certified organic sunflower seeds. Year-round formula for canaries and finches as well as budgies (parakeets) and other small parrots. Breeding Birds: Birds should be fed High Potency Formula 1-2 months prior to the breeding period and until chicks are weaned or for at least six months before resuming Adult Lifetime Formula. The amount of supplemental certified organic vegetables and fruits may be increased until the chicks are weaned. For each 2 Tbs (20 g) Formula, add Â½ (5 g) Tbs certified organic sunflower seeds. Year-round formula for all medium to large parrots, especially African greys, cockatoos, large conures, eclectus, macaws and pionus. Other species may be switched to Adult Lifetime Formula after a 6 month conversion period. Special needs: For birds that are molting, overweight, underweight, particularly active, housed in a cold climate, recovering from an illness or affected by liver or kidney disease. Breeding Birds: Birds should be fed High Potency Formula 1-2 months prior to the breeding period and until chicks are weaned or for at least six months before resuming Adult Lifetime Formula. The amount of supplemental certified organic vegetables and fruits may be increased until the chicks are weaned. For each 2 Tbs (20 g) formula, add Â½ Tbs (5 g) certified organic peanuts or almonds and 1Tbs (10 g) certified organic sunflower seeds. Harrison's Bird Food Power Treats are a tasty, toasted treat for all companion birds. Power Treats can be served dry, moistened, cold, warmed or crushed. Because they contain higher amounts of sugar and fat, they should only be used as a snack or during pellet conversion. © Copyright MY SAFE BIRD STORE. All Rights Reserved.